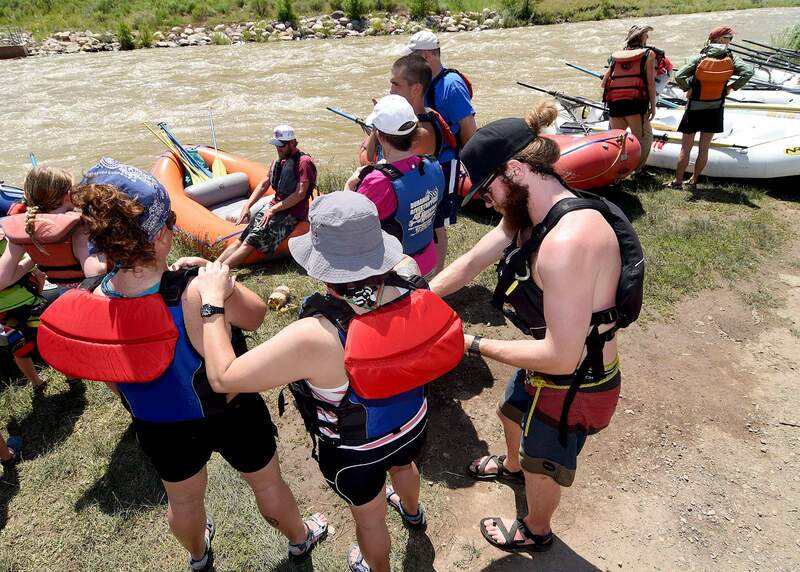 Durango Rivertrippers & Adventure Tours guide Galen Guillory, right, makes sure all passengers have their personal flotation devices on properly before a trip down the Animas River during a June 20, 2015, outing. The Durango Fire Protection District is warning people that the water in the Animas is too high and too cold to be on the river without life jackets. Durango Fire Protection District was called out for a water rescue near Iris Park in Durango Wednesday afternoon, and while it ended up being a nonevent, the incident illustrated the dangers of the Animas River in runoff season. They eventually got him out of the river, so the DFPD crew did not have to engage in a water rescue. The Animas River was running at 2,150 cubic feet per second with a water temperature of 53.8 degrees Wednesday.